Ryanair has announced a deal that will let its passengers make calls on mobile phones and use handheld devices such as Blackberries whilst in flight. It has signed up Onair, part owned by Airbus maker EADS, to allow mobile use on all its Boeing 737 aircraft. 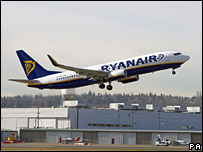 Passengers will be charged a roaming fee by mobile service provider, with Ryanair taking a slice of the income. If it gets regulatory approval, the scheme will be introduced by the middle of next year. "This is another revolutionary passenger service initiative," said Ryanair chief executive Michael O'Leary. "We will soon enable passengers to use their mobile phones and electronic communications devices in the air, just as they do on the ground." Ryanair shares climbed on the news of the potential extra source of revenue. There are worries that passengers bellowing "Hello, I'm on the plane" into their handsets could make for unpleasant journeys. Would you pay the roaming fee to use your mobile in the air? Is it worth it? What do you think of this announcement? Why would you pay Ryanair a fee to use your mobile phone? Stick to flying plains and stop trying to rip of your customers. This can only encourage more passenger annoyance and a subsequent increase in air rage. Some people just cannot shut up. I for one will be travelling no more with Ryanair if this policy is allowed. I thought the whole point of not using mobiles on flights was that they could cause interference with the flight controls. What next, mobile phones in petrol forecourts? Anyone who thinks mobile phone use will intrude on the tranquil, relaxing experience of air travel has clearly never flown with Ryanair. Being a passenger on an aircraft is bad enough without having to listen to people telling the world the latest office gossip, or what they had for lunch. I can see people wringing necks after having to sit next to someone shouting on their mobile telephone for the best part of the journey. Awful announcement- to be shut up in a 'big tin can' for several hours with people blabbering away is just terrible! I think it will be very convenient for passengers. We'll be able to ring friends/family and tell them of delays and receive emails via my phone. It's the last place where you can guarantee peace and quiet and no one shouting down their mobile. It's a really bad idea. I would avoid using Ryan Air. Are mobiles now safe to use on planes? I was always told that they interfered with electronics or could cause an explosion when the plane is refuelling? Does this now mean I can use my mobile in hospitals and at petrol stations - this is sending mixed signals. I can't think of anything worse than people making calls on a plane. It's bad enough on other forms of public transport. The odd telephone call on a train or bus doesn't annoy me, people who play their ring tones or play games without putting their button tones on silent are the problem. No call is that important it can't wait until you land. The plane is the last bastion of the mobile loather, keep it that way. And allow terrorists to detonate explosives they've put in their luggage? No thanks. I'll stick to more secure airlines.